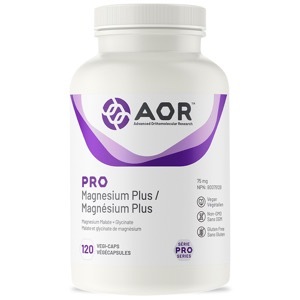 Pro Magnesium Plus provides fully-reacted magnesium malate and magnesium glycinate. This simple, yet effective formula combines two of the most popular forms of magnesium for optimal effectiveness. Magnesium helps maintain proper muscle function, metabolize carbohydrates, proteins, and fats; and is a factor in foundational health maintenance. The malic acid from magnesium malate is also important in the production of ATP during physical activity, while the amino acid glycine from the magnesium glycinate has a calming effect, since it acts as a central inhibitory neurotransmitter. Pro Magnesium plus is free of low quality forms and contains only a true chelate of magnesium with malic acid and glycinate.